This article applies to Skype (version 7). Bots are artificially intelligent programs that can do many useful things like search for news, summarize webpages, play games, and more. You can start chatting with a bot just like you chat with friends - simply click on the bot and start typing. How do I add bots? From Contacts, select Bots from the drop down menu. Alternatively, you can find available bots by tapping the floating action button, and then tap Find bots. On Skype Lite: Tap the bot icon for a list of suggested bots, or search for bots from Contacts by tapping the floating action button, and then tap find bots. Select the bot icon in the Recent tab. Alternatively, you can find available bots in your Contacts. Select the Add bots icon. Scroll through the list of available bots to find the one you want. When you've selected one, select Add bot (or Get Started). How do I know a Skype bot is a certified bot? 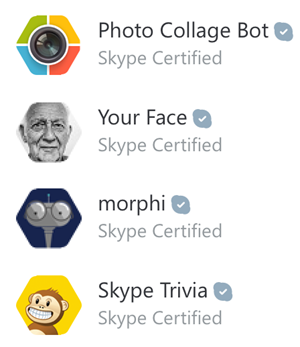 The Skype bot profile will say Skype Certified. Normal avatars are round. A Skype bot's avatar is hexagon-shaped. You will see a gray tick mark next to the contact name. How do I block or remove a bot? You can block or remove a bot the same way you would a regular Skype contact. Get help with blocking or removing a contact. If you want to report feedback on a specific bot, contact the bot developer directly. You'll find the name of the developer in the 'created by' section of the bot's profile. In which countries are Skype bots available? Skype bots are currently available in the following countries/markets; specific bot availability is determined by the bot developer.